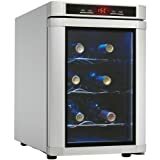 If you need to store and cool only half a dozen bottles of wine at the same time then a 6-bottle wine cooler refrigerator is a perfect choice. Most of these units use thermoelectric cooling technology. This new technic is best applied in small appliances. 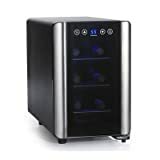 6 bottle wine cooler refrigerators have single temperature zone which means that you can set only one temperature level to keep your wines at, while in a dual zone wine cooler you can adjust two different temperatures: one for reds, and one for whites or sparkling wines. Here are some recommended 6-bottle wine refrigerators. This compact model by Danby can hold max. 6 standard size wine bottles on 3 chrome-plated metal shelves. The cooler can maintain 4°C – 22 °C (39 °F – 77 °F) temperature range so you can chill white or red wines. A red LED dsiplay – which goes well with the black finish – on the upper front of the fridge indicates the set temperature. It is a freestanding fridge that can be placed on kitchen counter tops. With only 11 inch width these slim wine coolers can be conveniently fitted in narrow places. The blue interior lights lend elegant appearance to the appliance. Price range: $90 – $110 ($15 – $18.3 per bottle). TIP: Read reviews of other Danby wine coolers and refrigerators. 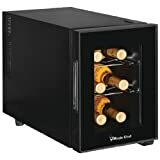 This compact, 6-bottle wine refrigerator by Vinotemp also uses the thermolectric cooling system which has the benefit of silent, vibration-free operation. It can hold up to 6 standard wine bottles on its 3 pull-out, chrome-plated wire racks. The double paned, tinted glass door ensures good thermal insulation and filters out UV rays that can be harmful to wines in case of long-term exposure. The stainless steel cabinet‘ s dimensions (width: 10.25 “, depth: 18.25 “, Height: 16.25 “) allow you to place the wine cooler on the top of the kitchen counter. You can adjust temperature in the range of: 44°F – 66°F. Price: cc. $160 – $170 ($26.7 – $28.3 per bottle). 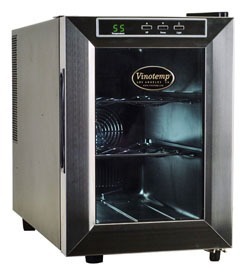 TIP: The Vinotemp VT-6V Thermoelectric Wine Cooler is another great small-capacity wine cooler. 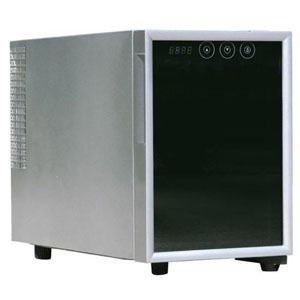 Take a look at other small capacity stainless steel wine coolers. It accommodates 6 standard 750-ml bottles on 2 pull-out wire racks. The silver cabinet with silver trimmed, reflective glass door looks very sleek. You can easily set the cabinet temperature between 44 and 66 °F by the touch pad controls. It is fairly quite (30 dBA according to the manufacturer’s website). Electricity consumption: cc. 0.5 kWh/24 hours. Price: cc. $100 ($16.7 per bottle). This is a nice contemporary home cellar in black and stainless steel design ideal for countertop placement. Quality, removable metal shelves hold 6 standard Bordeaux size bottles. The digital touch controls (temperature can be adjusted from 44 to 66°F) and the blue LED display go well with the darkened glass door. Features silent, eco-fiendly superconductive (thermoelectric) cooling technology (max. ambient temperature is 77°F). Can be used as freestanding only to ensure proper ventilation. Price: $130 ($21.7 per bottle). Warranty: 90 days, with 30-days return policy (in original packaging). Take a look at the Haier 6-bottle wine cooler. 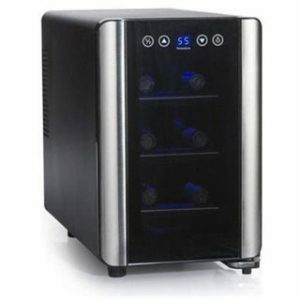 Benefits and features of the Wine Enthusiast 6-Bottle Wine Cooler. 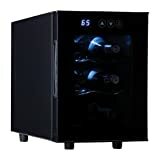 You might also be interested in 4-bottle wine coolers and other countertop wine fridges. TIP: Browse also our Wine Refrigerator Reviews page for more overview and in-depth articles on various brands and models.